Shear about 50% after spring flowering to encourage bushiness and fall blooms. Beautiful intense red! Pinks are a member of the carnation family and have been appreciated for centuries for their beauty, ease of care, and light spicy fragrance. The species deltoides is a low growing mat former less than a foot tall. It is long blooming, covered with masses of small flower from late spring into midsummer. They come in many shades of white, purple, pink, and purple. Pinks enjoy a well-drained almost gritty soil that is neutral to alkaline. Wet winter conditions can be fatal. They prefer full sun but can tolerate a very light shade. Cut back spent blooms hard for neatness, vigor, and to curtail prolific self seeding. 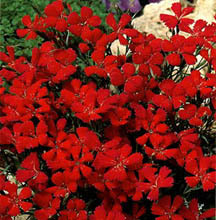 Division is not necessary but can be done in early spring or after flowering to obtain more plants. Space new plants about a foot apart.